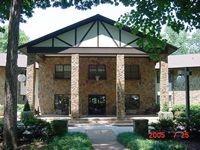 A full sevice Conference Center, located on 1100 wooded acres in central NC. Caraway has 80 bedrooms, 12 conference rooms, and a auditorium. All of your dining, lodging and meeting needs under one roof. We also have a 150 bed youth camp. Caraway is available to all Christian churches and religious groups an other approved non profit organizations. Meeting Equipment Technology Available: We provide TV/VCR's, and overheads in each conference room. We have LCD projectors available. We are wired for internet access as well. Our auditorium is equipped with modern audio and video technology. Located 7 miles west of Asheboro and Interstate 73/74. We are 25 miles south of Greensboro, and 17 miles from I-85. Closes major Highway is US 64.